Falkirk players are due back for pre-season training next Thursday, but Mark Kerr’s preparations are already well underway. The evergreen midfielder took just ten days off after the Bairns’ play-off defeat and has been back in the gym with a view to being ready when the squad reports back for duty and a trip to Ireland. At 34 most midfielders would be slowing down and feeling the effects of time, but Kerr says he has rarely felt better and, after returning to the club who gave him his professional debut 18 months ago, he attributes that to being back where it all began at the Bairns. “I had ten days resting but I’ve been back in the gym already,” said Kerr, who was speaking at the Bank of Scotland Midnight League final at The Falkirk Stadium. “In the last 18 months I’ve felt better than I have for the last few years. “I think that’s the surroundings in a large part, it’s given me a freshness back in my legs. “When you’re playing with enjoyment and you love coming to work every day then it really helps. Kerr is one of Peter Houston’s more senior squad members and the midfielder says he allows the players to form their own bond, letting the combination of youth and experience find its own way - and that the club is a better place for it. 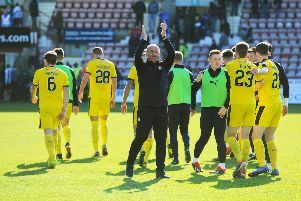 “It’s a great time to be here, we’ve had success at the club, we’re high up in the league and we’ve got a good bunch of boys in the dressing room,” Kerr said. “The gaffer also understands older players so I don’t think I could find a negative since I’ve been back here - I’m enjoying it. Kerr was speaking as he watched the regional finals of the Midnight League five-a-side matches that aim to keep youngsters aged 12 to 16 off the streets on Friday and Saturday nights. Bank of Scotland Midnight League is a free national network of diversionary five-a-side football activity, targeting males and females between 12 to 16 year olds across the country.